How the government uses the law to repress Hungary’s civic spirit. 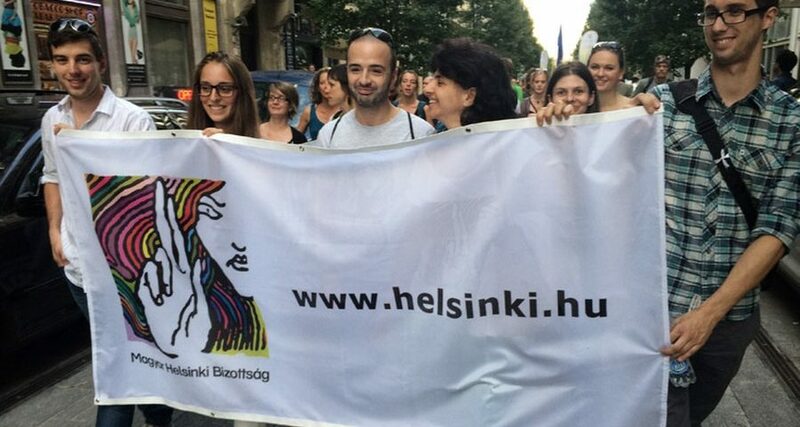 Joint statement of the Hungarian Helsinki Committee and Hungarian Civil Liberties Union1Abridged version; published by HHC’s permission. Full version..
On 18 January 2018, the Hungarian government launched the ‘Stop Soros’ package, a proposal of three laws that target civil society organisations. Draft law on immigration restraint order. These laws follow up on the 2017 NGO Law on foreign-funded organisations (Act LXXVI of 2017) over which the European Commission has decided to refer Hungary to the EU Court of Justice. The 2017 NGO Law requires that NGOs receiving foreign funding over €24,000 register on a separate list, report and publicly label themselves as ‘foreign-funded’ or face sanctions. The latest proposal comes amidst a wider effort to stigmatize specific individuals and non-governmental organisations, and has been presented as a bid to stop ‘illegal migration’, to ‘strengthen the protection of borders’ and to ‘protect Hungary’s national security interests’. The proposed measures will affect a number of areas key to the functioning of civic life in Hungary. Despite their name, they not only target those who allegedly engage in supporting or funding ‘illegal migration’, but through less-conspicuous provisions also target the wider group of NGOs. Organisations that receive foreign funding and that allegedly “propagate mass migration” or “support illegal migration” would be required to register at court as such, acknowledging such “illegal” activity. They would have to make this stigmatizing information public, for example by publishing this label on every publication. Any foreign revenue given for “supporting illegal migration” for organisations which register would be subjected to a 25% tax. Legal procedures for non-compliance could end in a fine of 200% of the foreign revenue or dissolution of the organisation. NGOs would be required to hold a separate bank account for foreign funds, which would be monitored by the prosecutor’s office and the Central Bank. Also, NGOs would be required to disclose to authorities the personal data of any person they make payments to (staff, contractors, partners). By introducing much stricter requirements, any NGO could lose its public benefit status, which gives tax advantages to both organisation and their clients. The proposal foresees that at least half of the funding received by such organisations during a reporting year must come from domestic sources. Furthermore, organisations will need to demonstrate that their annual income from the 1% personal income tax designations (a tax scheme intended to stimulate individual 1 giving to the civic sector) is at least half of their income from foreign funding. So far, approximately 20% of NGOs in Hungary operate under the public benefit status. Third, the proposal would impose new restrictions on the movement of both Hungarian and non-Hungarian nationals involved in humanitarian support such as refugee assistance at the border. The proposals also include provisions for the exclusion of nationals of other countries from Hungarian territory. Following up on the 2017 NGO Law on foreign-funded organisations, the latest draft laws are potentially lethal blows to civil society in Hungary: their novelty is that the threat is now existential and also targets individuals. Should the proposals be adopted in spring 2018 without major changes, they will cause grave and irreparable damage to Hungarian civil society. By the end of 2018, a number of NGOs will be unable to function or carry out core work due to five direct and imminent threats to their mission. Domestic funding for the work of the civil sector is largely available from public funds administered by national or local government agencies, which is already politically conditioned and discourages public advocacy or exposing faulty or inefficient public services. An estimated 80-85% of about 900-1,000 prominent NGOs risk losing public benefit status, i.e. tax-free status and other advantages. This will dramatically raise costs for NGOs and for clients, who will have to pay taxes after the value of free services/assistance (15% personal income tax + 19.5% health care tax). NGOs that have refused to register under the 2017 Law on foreign-funded NGOs can expect to face legal procedures for non-compliance once they publish their annual financial reports at the end of May 2018. These procedures are likely to roll out during the summer and will further aggravate the pressure. Politically-motivated tax investigations could pave the way for repressive criminal prosecutions against NGO leaders and human rights defenders. Stigmatising civic groups and individuals as national security risks will have a chilling effect on other groups, supporters and clients by sending a clear message that at any point in time they could become targets as well. The proposed laws could serve as a model within the EU to thwart the valuable work of civil society organisations that fight for the respect of human rights in the European Union, a danger that the EU Fundamental Rights Agency has recently underlined. 1. ↑ Abridged version; published by HHC’s permission. Full version.